Thousand Beginnings follows two women on their cyclical quest for freedom from ancient behavioural patterns. 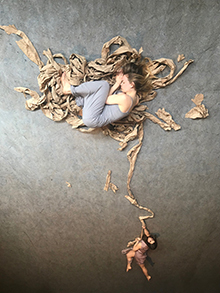 Interweaving rigorous physicality with poetic text, the two performers explore the rites of passage in the life of a woman and her quest for stillness within. Under The Umbrella Collective’s debut Thousand Beginnings is an intimate, evocative meditation on womanhood, sisterhood, and coming of age, as we begin again and again as a means of survival. Our collective is an umbrella under which female artists come together and create new works. As a process oriented collective we strive for honesty and aesthetic risk-taking. We yearn to explore the richness of our linguistic and cultural ways of story telling through physical theatre making. All three creators have a strong background in devised, improvisation-based theatre creation. We started this process by asking the following questions: What does it mean to turn 30? As we evaluate our lives so far, what are we noticing about ourselves? Moving through the world as women, carrying not only our thoughts and patterns but also those of our parents and grandparents, how can we step into this next phase with awareness and self-actualization? What needs to end first so we can fully begin again? Under The Umbrella is made up of theatre artists Gulce Oral, Jewels Krauss and Margaret Muriel Legere. Jewels Krauss is a performer originally from Stuttgart who was last seen on Crow’s Theatre stage in Anton Piatigorsky’s play Breath in Between. Margaret Muriel Legere is a Halifax artist, currently doing a Masters in Directing at York University. Gulce Oral is a performer from Istanbul currently doing a Masters in Performance/Creation at York University. This show supposes awareness is our super power. As we discover our patterns, we are simultaneously in a state of struggle and revelation, each opposing and feeding the other, as we journey toward transformation.Thousand Beginnings is a physical exploration of that journey and the realization that transformation is not a destination.